Inshore- We have some very minor amounts of small dead bait fish around the area, but its still very spotty and irregular. 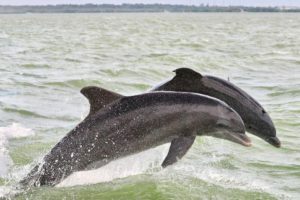 We are hoping it doesn’t get worse or kill our bait around the area, but the red tide levels reported by the FWC are still low in our area and not expected to do much damage. So we do NOT have red tide but we don’t have it bad enough where we are getting bunches of dead fish and we don’t have any issues with breathing yet around the beaches. However, that could change but were hoping we stay predominately red tide free as this spotty stuff we have now isn’t bad thankfully. The really bad areas are still south of Tampa bay. Fort de soto and shell key areas are much the same only spotty areas of dead fish and no serious fish kills. 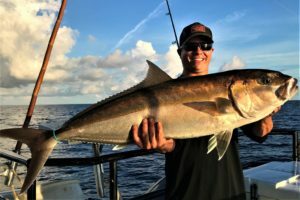 The snook bite is still going well around Johns Pass for now, and were looking forward to that continuing. We still have the bait in the area keeping the mackerel excited. Plus, the mangrove snapper action around the bridge lately has been very good as well. It’s a great time to come out and fish Johns Pass, and if you avoid the tail end of the incoming tide you won’t even think about any red tide or red tide effects. Only the very end of the incoming brings some scattered small dead fish that look like they got blown up north from the red tide that is thick at the south side of Tampa bay and south along Florida’s west coast starting at the south entrance to the bay. Tampa bay is still red tide free as well which is great news, were hoping our area and Tampa bay both stay clear! Near shore- We still have lots of white bait around near shore, they are a little further off the beaches now with the sporadic red tide moving in but the mackerel are still very active on the near shore artificial reefs and along the beaches where you find the bait. The kingfish haven’t showed up quite yet, but I would guesstimate that behind the next full moon we will see the kingfish return to the near shore waters. Hogfish bite has been very consistent as of late around 30-50ft of water using live shrimp or live fiddler crabs, but you have to soak the spot to get past the more aggressive feeding fish like the white grunts aka grey snapper, porgies, seabass and others. The lane snapper bite continues to be consistent near shore around the 60-80 foot areas. 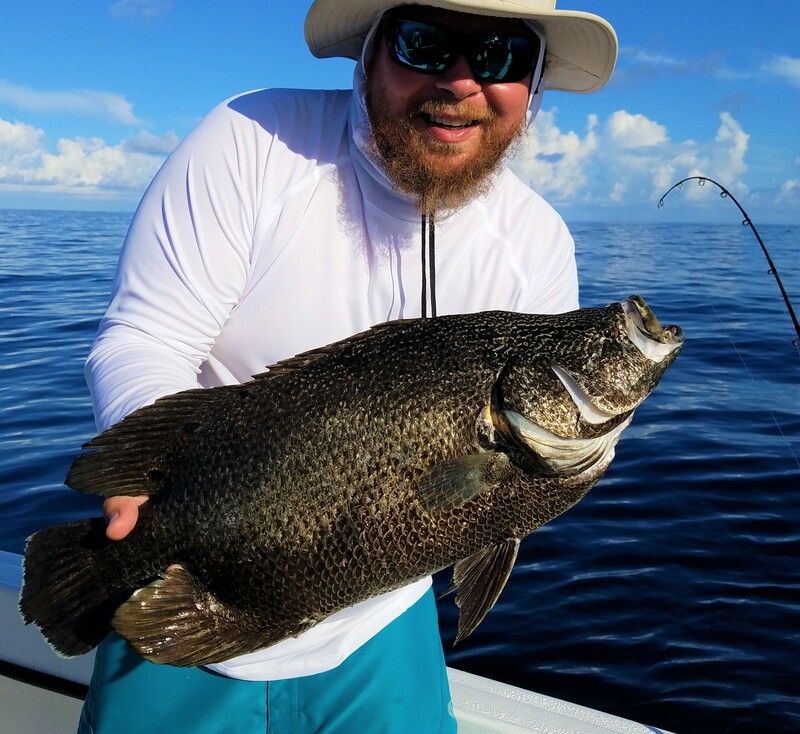 Red grouper are moving in around the deepest near shore waters anywhere from 80-100 foot of water were starting to see a more consistent red grouper bite. Offshore – This past week we did had the Flying HUB 1 take a 15 hour private fishing charter out for some deep drop fishing and they did very well around 500-1,000 foot of water fishing for yellowedge and snowy groupers. The weather is perfect right now for some long range deep drop adventures with electric reels, longs strips of squid or oily fish like bonita strips. We also stumbled across some floating debris on this recent deep drop trip and pulled off a handful of super nice triple tail. 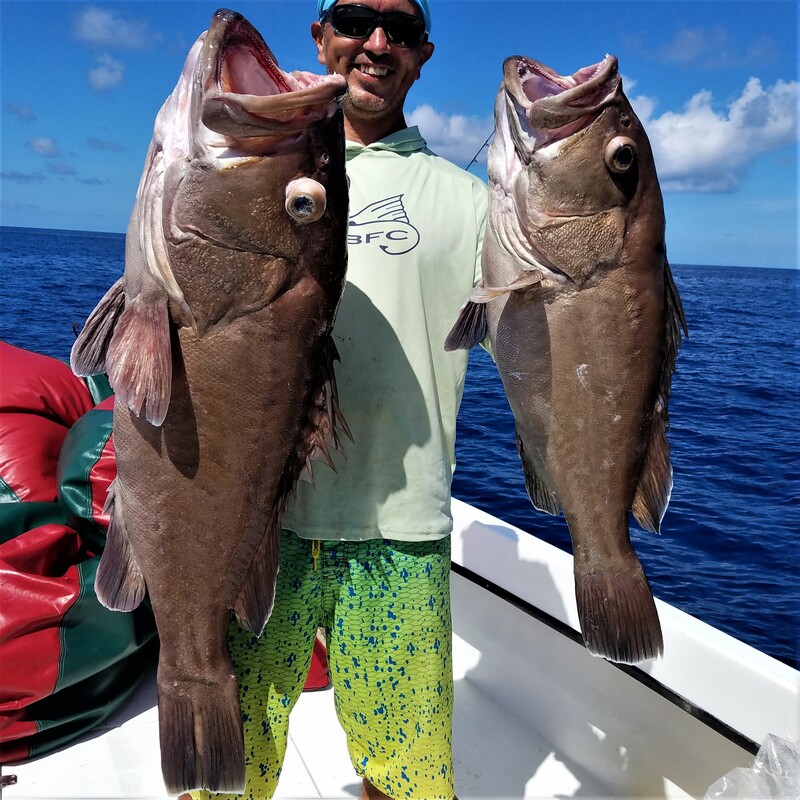 We didn’t have a 39 or 44 hour this past weekend but we had some 12 hours extreme trips fishing out in that same area the past few days and they did very well on Amberjack, a few fat red grouper and some nice gags and scamp too. Plus the deepwater porgies, vermillion, mangroves and yellowtail rounded out the boxes for a nice bite of fish this past week offshore. The best Amberjack fishing seems to be past 150 foot of water, and they are open until the end of October. However, keep in mind the gray trigger fish season has CLOSED. If you can’t make the Saturday fishing seminar at Bass pro shops join Capt Dylan Hubbard online Sunday night at 8:30 for some fishing conversation Q&A fun during the online fishing show by Hubbard’s Marina!